A new inpatient rehabilitation unit opened at Hartford Hospital recently. It’s a 26-bed unit that specializes in physical, occupational and speech therapy for patients who have suffered a major illness or injury. Dr. Maria Tsarouhas of the Hartford Hospital In-Patient Rehabilitation Unit has details on what that means. Q: This unit opened fully in the fall of 2018. Tell us about the patients you have worked with so far. A: Since fully opening in October, we have served high-quality, personalized and coordinated care to over 150 patients so they can improve their functional independence in their day to day activities so they can enjoy the best possible quality of life when they return home. We have excellent outcomes to support this. Patients are coming to the Inpatient Rehab Unit to get better. These are patients who have lost some level of independence due to injuries or illness. They may have difficulty with their speech and communication, thinking or processing, difficulty swallowing, difficulty with washing or dressing, toileting, balance and coordination, walking or climbing stairs. Patients who may experience some or all of these difficulties may be those injured as a result of trauma, accidents on the road or patients who have been hospitalized due to stroke, brain tumor, brain injury, multiple sclerosis, Parkinson’s disease, spinal cord injury, heart surgery, amputation and such. Q: Provide us with some insights on the unit itself, and some of the state-of-the-art equipment and comprehensive treatments that you use to help those with serious injuries/illnesses to reclaim their lives. A: There is a wide variety of technology that can benefit patients in regaining functional independence. Equipment such as the Biodex Balance and NxStep Unweighting System to help with balance and walking, Bioness Electrical Stimulation for the upper and lower extremities for patients recovering from a neurological injury affecting the brain or spinal cord, the Bioness BITS interactive touchscreen that challenges many aspects of a patient’s visual perception and though-processing, IOPI and Synchrony which provide real-time feedback to strengthen muscles in voicing and swallow and MOTOMed arm and leg bikes. In addition to the hands-on therapy and use of technology, patients also benefit from recreational therapy, group sessions and support from nursing-staff carryover recommendations for their rehab and recovery. Q: What can patients expect if they rehab on this unit? 100 percent, all-private rooms for comfort and privacy. Close medical monitoring from specialized rehabilitation doctors and nurses. A customized treatment plan focused on the skills needed to function safely at home. A minimum of three hours of therapy per day, at least 5-6 days a week. A state-of-the-art “skills” apartment where patients practice activities of daily living. Family and caregiver support and training throughout treatment. Convenient access to a full range of hospital services, if needed. The coordination of follow-up services to monitor and extend progress at home. Q: Does the inpatient unit at the hospital help patients to go home quicker? A: Yes. Most patients spend about 12-13 days on our unit and are discharged home faster and healthier compared to other levels of care. 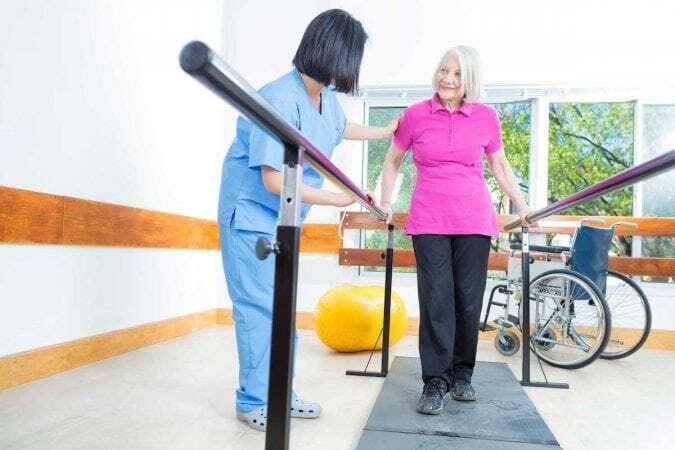 Patients who receive care in a hospital-based rehab unit are also less likely to be readmitted to the hospital after discharge.